If you’re looking for some fun summer activities for kids, then you’ve come to the right place! 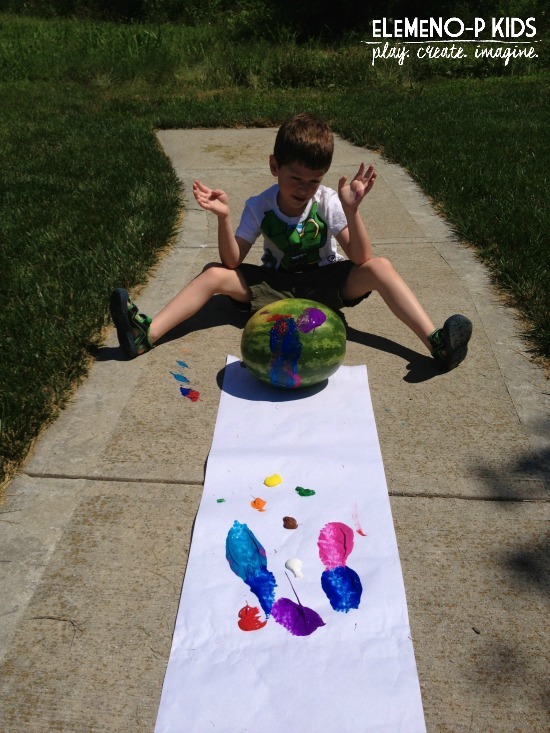 We recently had a watermelon-themed day full of watermelon crafts, activities, and sensory play! 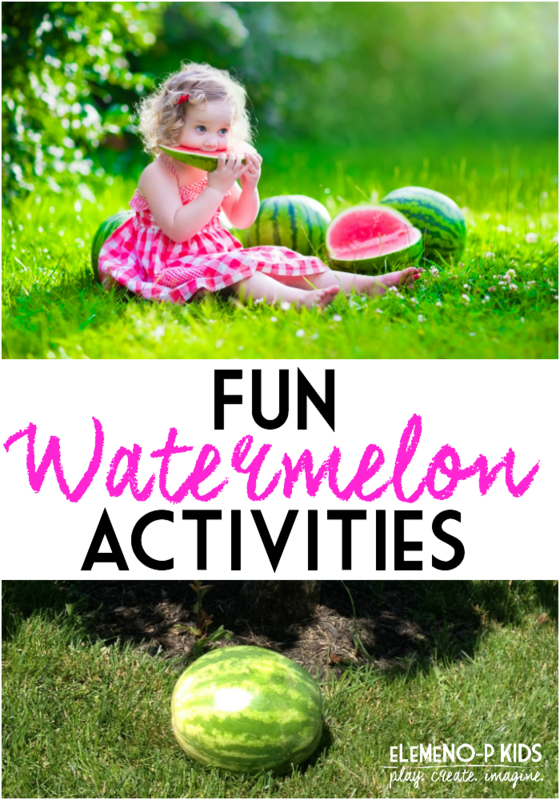 Since it’s summer time and it’s so hot outside these watermelon activities were just so much fun and a great way to cool off! Plus, you can eat the watermelon while you play with the shell. And who doesn’t like watermelon? 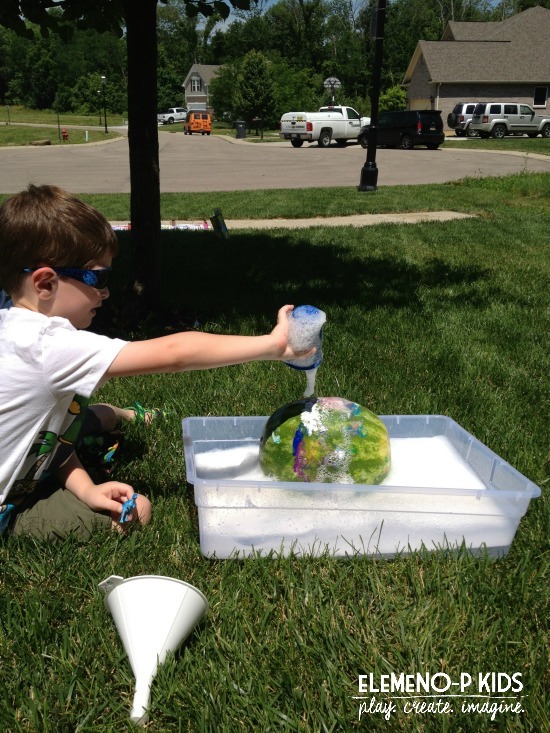 These activities are great for science play, gross motor skills, art, and math! 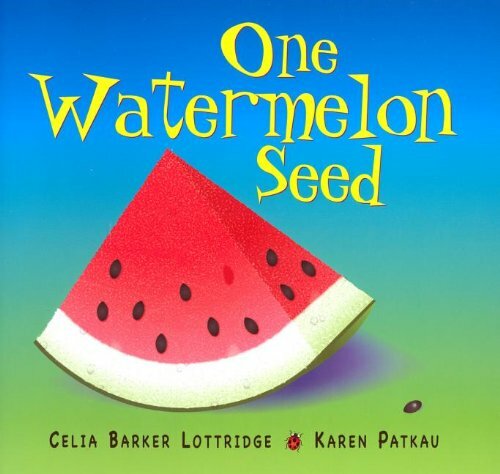 Come join us on our watermelon adventure! *This post was originally written in 2013, but has been updated. *This post may contain affiliate links. Please see our disclosure policy. 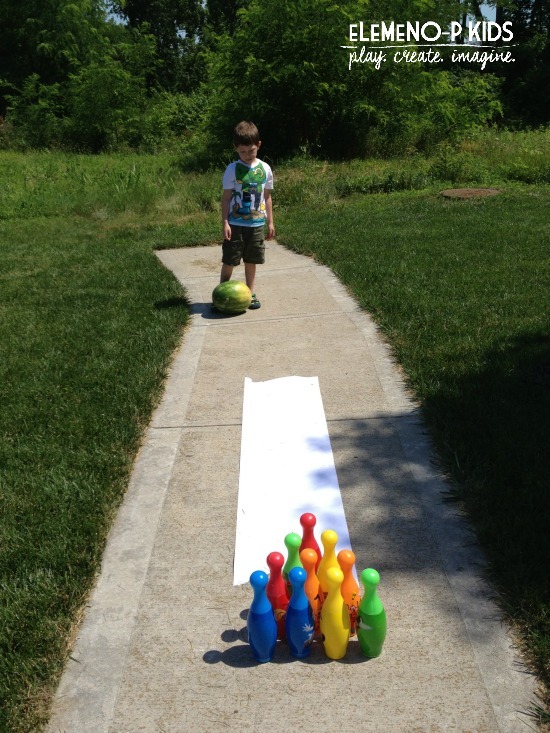 First, we did watermelon bowling with his plastic bowling set, and Mason LOVED it! He just laughed and laughed each time the watermelon rolled the opposite way of the pins. He even came up with different games to play! The first game he decided to keep backing up further and further from the pins. The second game he kept adding pins one at a time to hit, so we started with 1 and worked our way up to 10. This is a great idea for building those counting skills! 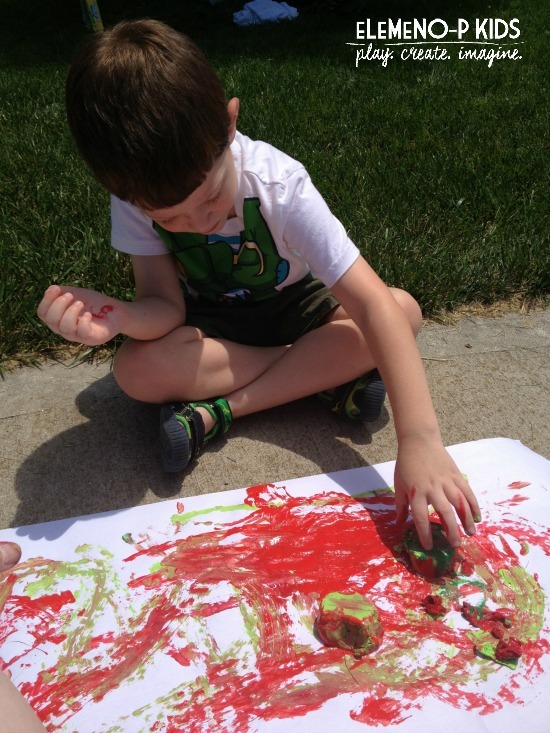 Next, we did watermelon painting with washable craft paint (this is our favorite paint)! 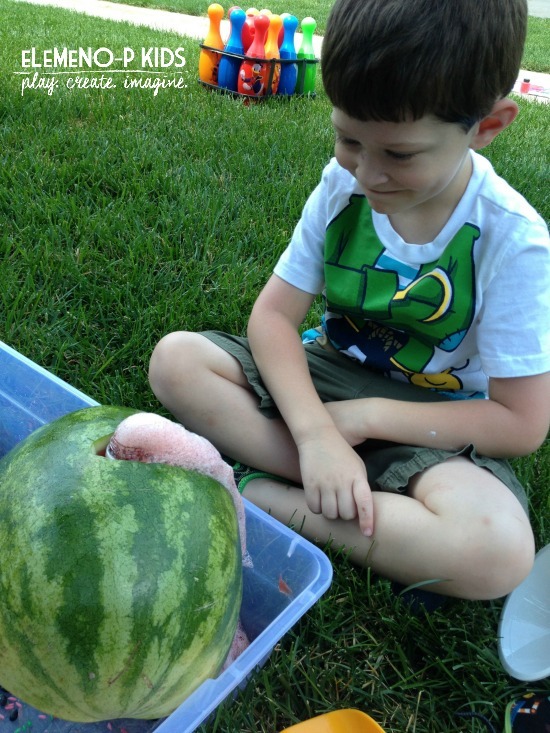 The goal is to do all of the activities that require the whole watermelon, because later we’ll be cutting it all up! This one was super fun. We started off with me sitting on one side, and M. sitting on the other and we rolled it back and forth to each other across the art paper. That got kind of messy with the watermelon going on the concrete (sorry, Daddy!) so we just stood up to have better control of Mr.Watermelon. 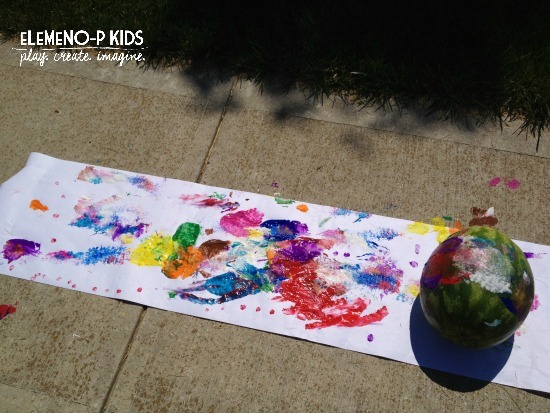 We just loved the prints that the watermelon made on the paper. Of course, after all that paint, watermelon needed a bath! He adored this part! Just put him in a big tub of cold, soapy water and have fun! I use All-Natural Dish Soap so as not to hurt little one’s hands. See that big watermelon in the middle? You wouldn’t believe the things M. pretended it was. “Mommy, the watermelon is the planet and the water is the universe.” After he played that for a long time, he pretended the dino was running from the soapy, slithery snake and the snake couldn’t get up the mountain because was too “swipperwy.” And then the watermelon became a diving board, and the water the swimming pool! That’s why hands-on sensory play is so important y’all! It encourages imagination and language like you wouldn’t believe! Next, came the most anticipated part! 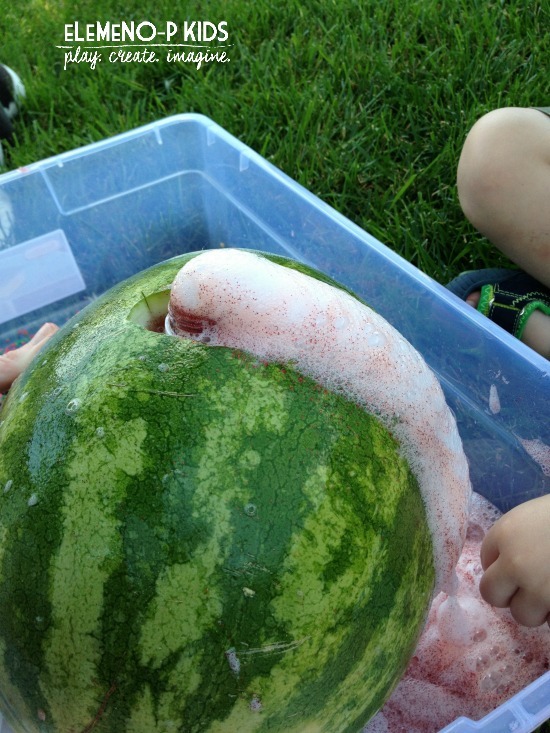 WATERMELON VOLCANO! Ready to make your own volcano? 1. Cut a hole in the center of one of the 1/2 watermelon shells and put a water bottle underneath. 2. Add baking soda to the bottle along with Watermelon Kool-aid for scented lava, and red glitter for “sparks” as M. said. 3. To get the lava nice and foamy add some drops of dish soap. 4. Slowly pour in white vinegar until it starts bubbling over! As it was bubbling over, he put a dinosaur underneath and said, “The dinosaur is taking a shower!” He really enjoyed the volcano the most. 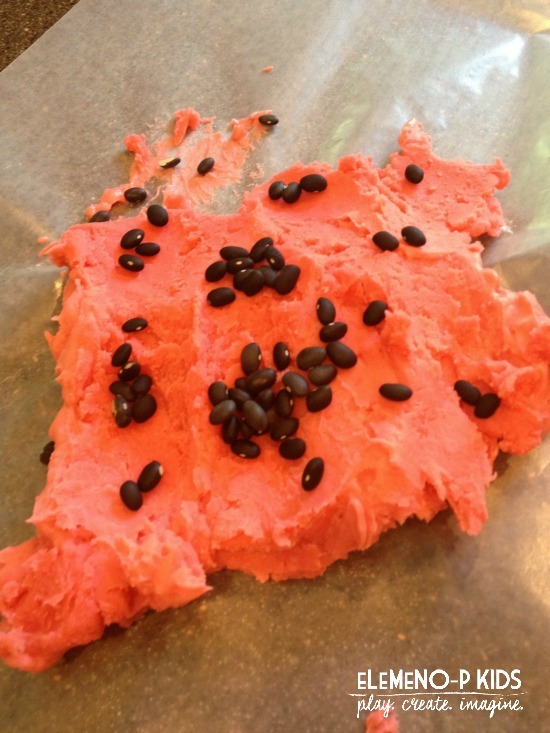 The rest of the environment included some left-over watermelon scented red and green rice we had and some black beans for the watermelon seed look. M then dumped in some leaves, dinosaurs, zoo animals, and whatever else he wanted to explore the volcano with. By this point in the afternoon, we were hot and sweaty, so it was the perfect time to do some ice painting! This is so easy to do! You can use a muffin pan or ice cube tray. I poured some green paint at the bottom (any paint will do, we used Crayola Washables) and then I added some seeds (black beans) to the middle. I then layered some red paint on top and added more seeds. Freeze. And VOILA! 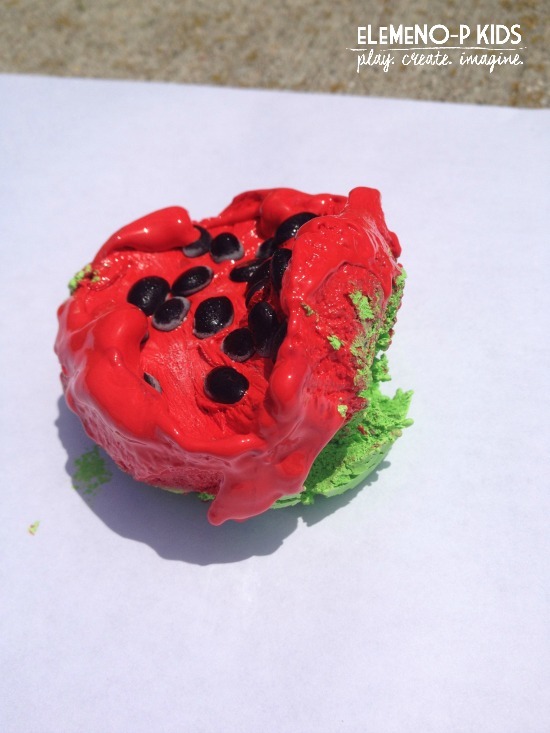 After pulling from the freezer sprinkle some watermelon kool-aid on top and you have watermelon-scented ice paint! This was a messy (but we love messy) and FUN project! Who knew you could freeze paint?! The feeling of the paint melting and the cold of the ice was just too awesome! I loved how the seeds came out onto the painting while you were using the ice cubes too! It added to the whole element very nicely! Dump all the ingredients into a pot and whisk them together. Heat on medium/high heat until the mixture clumps together. Stir the entire time to prevent sticking to the bottom of the pot. Once it clumps up nicely, put on wax paper to cool off. After cooling, add some black beans for seeds and let the playing begin! Well, that’s a watermelon wrap! I hope you enjoyed seeing our Wild Watermelon Day! 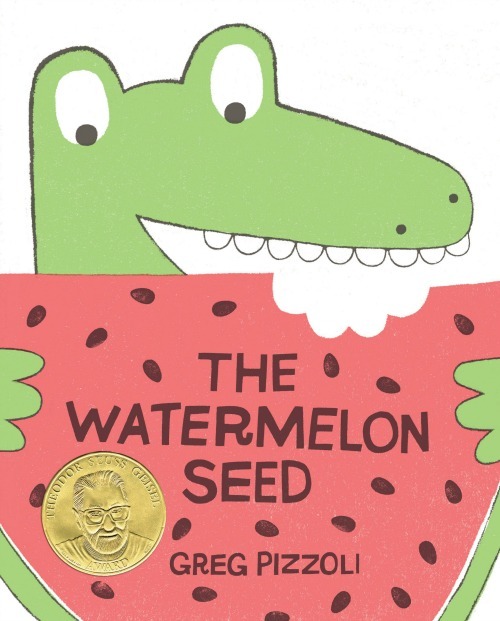 To wind down your day, here’s some super fun watermelon books you can enjoy!